Internal Mommylogue: I’ve crossed a line somewhere. Thanks for stopping by! 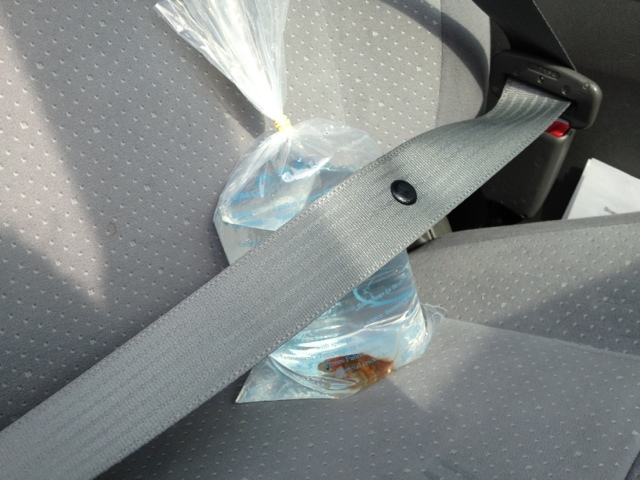 My toddler wanted to hug the fish on the way home and has shown…um… reluctance to wear a seat belt in the past, so this was simply a two-for-one teachable moment: 1. Everyone wears a seat belt. Everyone. 2. The fish survived toddler hugs. I remember seeing a picture of someone belting their bag of potato chips – that was too much. The fish is kinda reasonable. The sad part is, if buckling up potato chips encouraged my child to willing buckle up, then sign me up! Ahh! I really have crossed a line! Thanks for the comment! I love it, I seat belt the chinese take out, pumpkins, watermelon and my large Dunkin Donuts to go coffee mug! Hurray! I’m not the only one! Is this a preference, practicality, or a desperate attempt to encourage a two year old’s cooperation?